Nuri is a beekeeper; his wife, Afra, an artist. They live a simple life, rich in family and friends, in the beautiful Syrian city of Aleppo – until the unthinkable happens. When all they care for is destroyed by war, they are forced to escape. But what Afra has seen is so terrible she has gone blind, and so they must embark on a perilous journey through Turkey and Greece towards an uncertain future in Britain. On the way, Nuri is sustained by the knowledge that waiting for them is Mustafa, his cousin and business partner, who has started an apiary and is teaching fellow refugees in Yorkshire to keep bees. As Nuri and Afra travel through a broken world, they must confront not only the pain of their own unspeakable loss, but dangers that would overwhelm the bravest of souls. Above all – and perhaps this is the hardest thing they face – they must journey to find each other again. 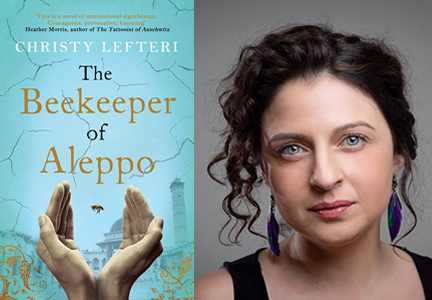 Moving, powerful, compassionate and beautifully written, The Beekeeper of Aleppo is a testament to the triumph of the human spirit. Told with deceptive simplicity, it is the kind of book that reminds us of the power of storytelling. We’re delighted to welcome Christy to Booka!